I lie. I am not a seasonal person. I do not match my mugs with my breakfast bowls, and I certainly do not plan my nail polish colors to fit the seasons. as seen by this post. 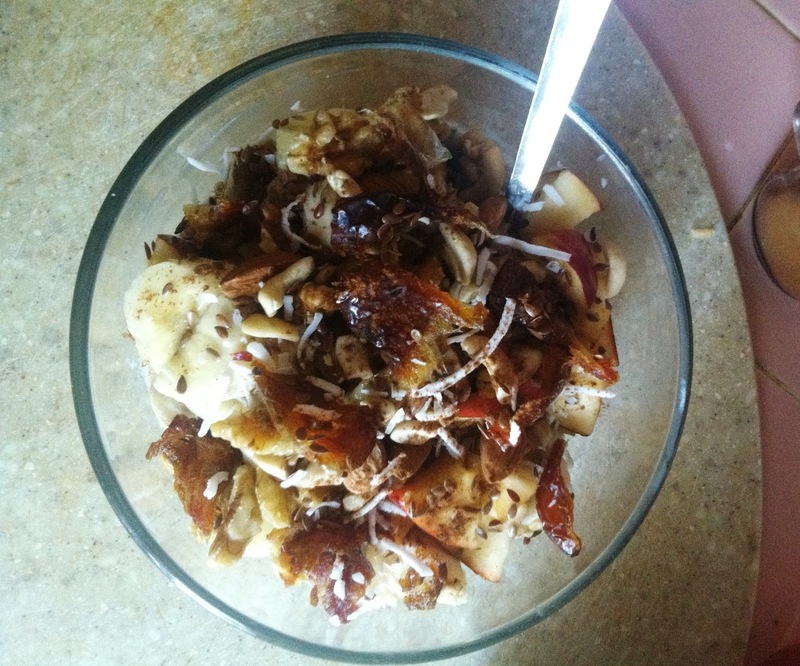 however, as I was making this breakfast granola, I realized that these colors, (not through any intention or purpose, just because these ingredients were the dregs left in my fridge) were quite autumnal. Therefore, I decided to pretend that I knew what I was talking about, and photographed my journey through autumnal granola making. So just pretend I did this on purpose. Of course, in order to prepare this deliciously autumnus granola (ignore the made up word), one does need a few ingredients. You don’t need to have ingredients, it would just, you know, be helpful. 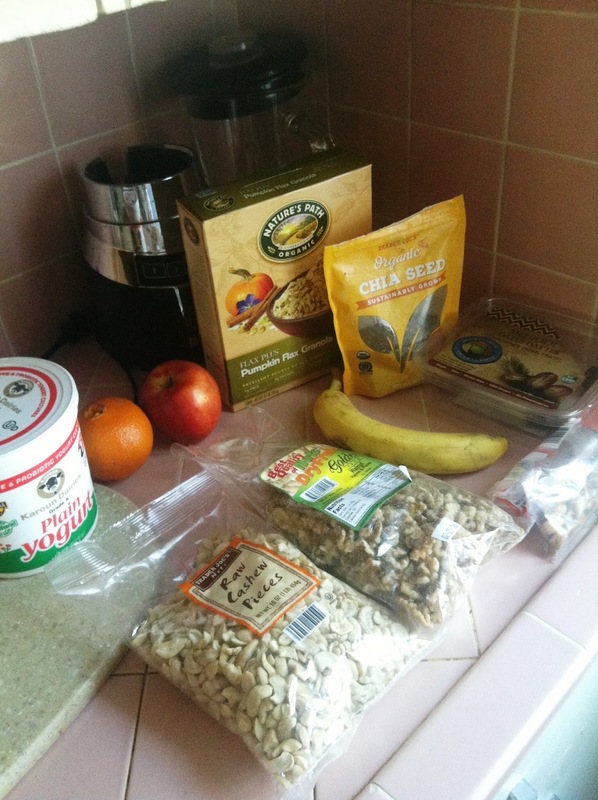 All of these ingredients are extremely good for you, and the banana and dates act as nutrient dense natural sweeteners so you don’t need any sugar or honey that’s trapped in a plastic bear to sweeten this granola. Plus, the colors really are very autumnal, which is my favorite season, and when I ate this granola, it allowed me to pretend just for a minute, that the September LA weather outside my window wasn’t a blazing hot scorchiness (that everyone wants to kill), but the cool crisp autumn it should really be. Well, enough with the mushy stuff. Onward. 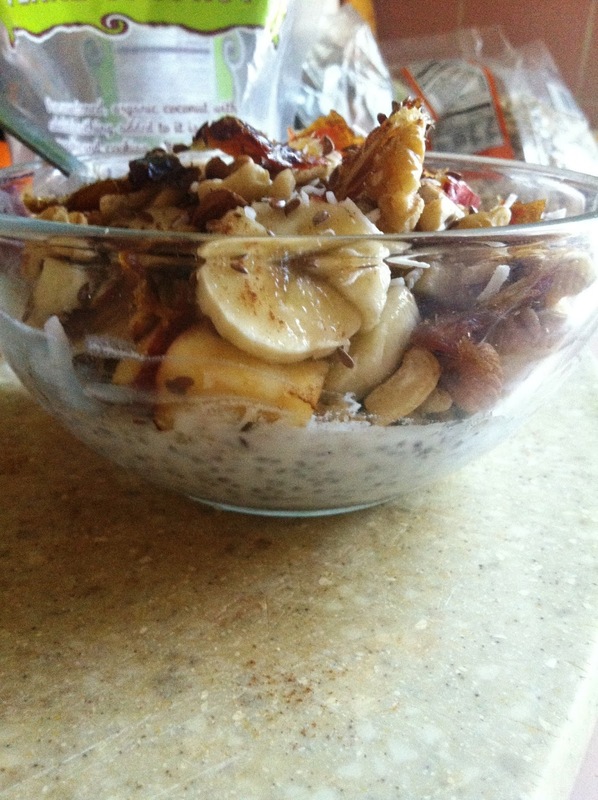 The first thing you do is take a medium sized cup with some water in it and add 2-3 tablespoons of chia seeds. You don’t necessarily need this ingredient, however, I find that the gelled chia seeds mixed together with the yogurt gives it a delicious pudding consistency that just vamps up the taste of the granola even more. Plus chia seeds are super duper nutrient dense. Look at me- waxing poetic. 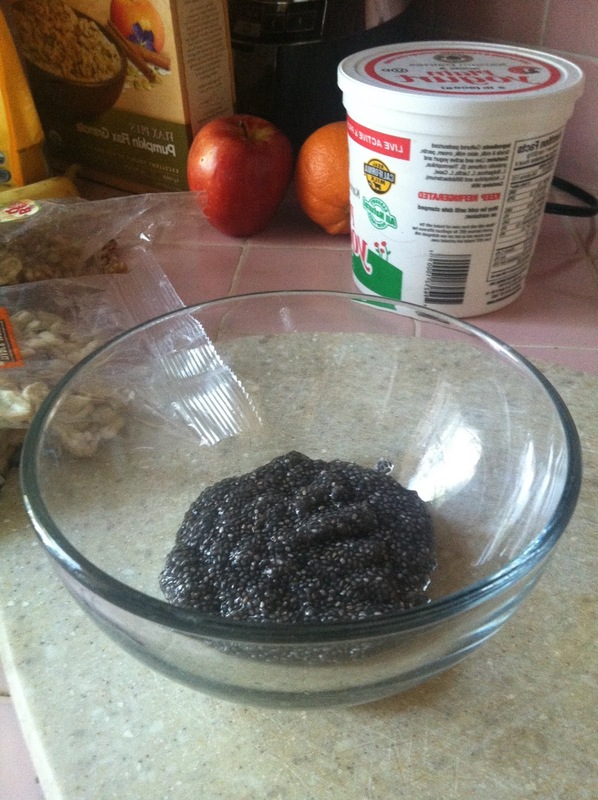 Anyway, ideally, you would stir the chia seeds into the water in your cup and let that sit in your fridge over night. But no one does that, so you can let it sit for 20 minutes as well. It’s ok, I know no one does that either, so just swish your finger in the cup, stirring the chia seeds into the water until the seeds absorb all of the liquid. This will take about 1 minute, but by then, the chia seeds will have formed a gelled consistency with the water that looks something like the picture above. My chia seeds looked like that after a minute of lazy swishing by the way, so no worries. Then, just transfer the gelled seeds into an empty bowl. 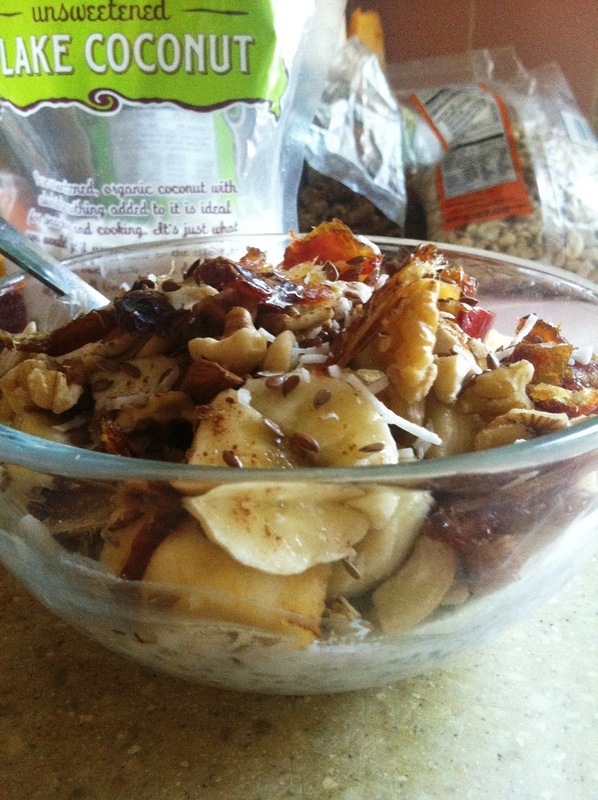 -Then, add your banana, apple, nuts and dates. 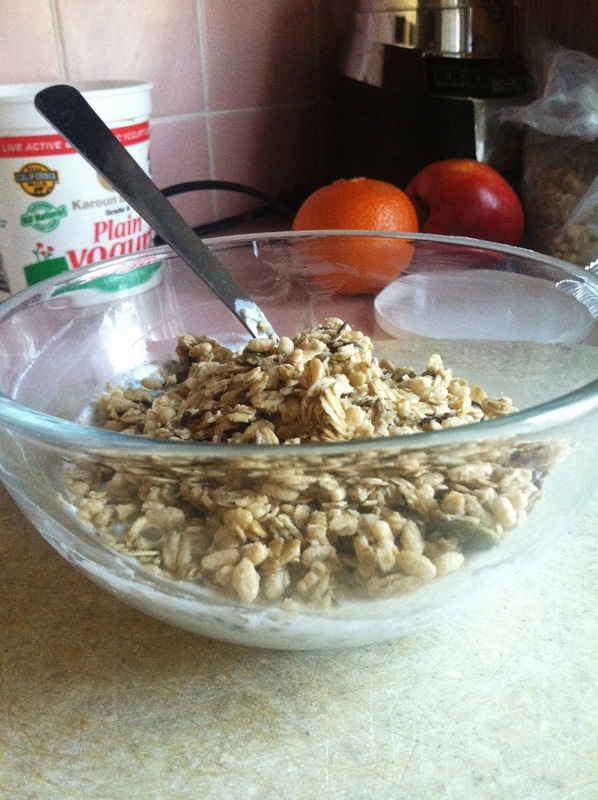 I think it’s here that i realized how fallish my granola started to look. I think I had an “aww” moment to go along with that realization as well. -Now, add the flax seeds, coconut flakes and cinnamon, and you have got your self a granola that is worthy of calling itself an edible tree. Just look at those reds, browns and creams just waiting to be devoured- like seriously- an edible tree. And there you have it, folks, an autumnal granola. Something we just renamed the edible tree. My mouth is watering just looking at that granola, even though I just had breakfast. 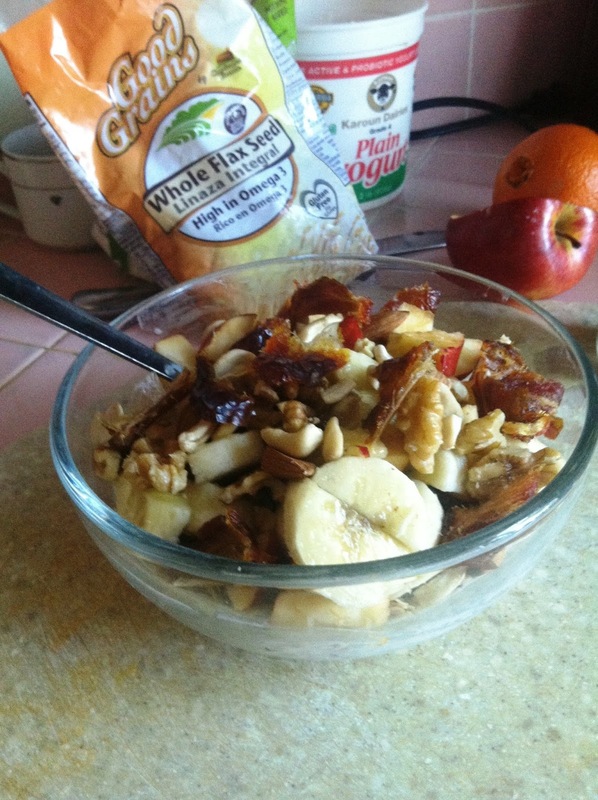 So, thanks for reading my blither, i hope you have a wonderful Wednesday, don’t forget to leave a comment, (they always warm my heart) and tell me if you made this granola! And/or what changes you made to it, I always love to see other people’s variations. ASTA LA VISTA- CYNICAL DUCHESS.